For commercial and institutional use. Reinforced with cross braces for extra rigidity and strength. Made with thicker grades of stainless steel to withstand heavier usage. Available in 2,3,4,5 step configurations. For commercial and institutional use. Made only in thicker grades of stainless steel to withstand heavier usage. Recommended for light commercial and residential use. 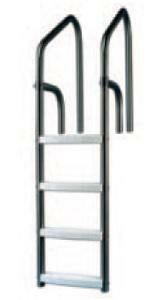 Ladder frames go slightly deeper into water and extend slightly higher above deck compared to normal residential ladders. Recommended only for concrete or vinyl-lined pools. 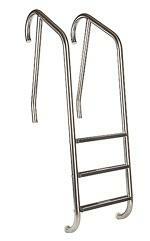 The Therapeutic Ladder is designed for hospital and/or handicapped treatment pools. 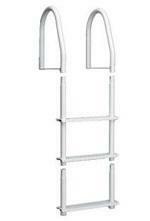 Sloping design, handrails and steps spaced 10" apart permit easy entry by the elderly or infirm. Available in 2,3,4,5 step configurations. Available in 24", 29", 35" setbacks. 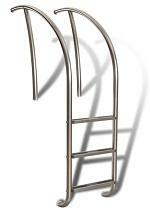 The Artisan Series Ladder is a designer inspired ladder that provides an elegant custom look for any pool environment. 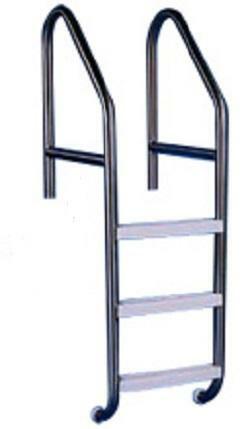 It has custom stainless steel treads and comes in 3 step only. 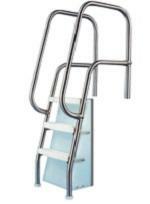 The Meridian Series Ladder is a designer inspired ladder that provides an elegant custom look for any pool environment. 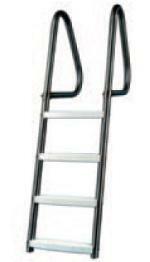 It has custom stainless steel treads and comes in 3 step only. 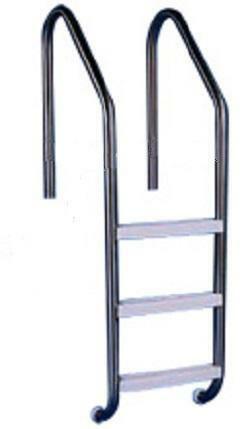 For installation on fixed concrete piers where bottom support for ladder is not possible. Installed in anchor sockets cast into deck. 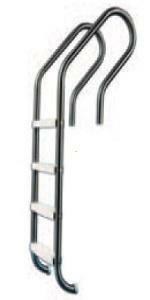 For installation on fixed wooden docks where bottom support for ladder is not possible. Fastened to decking with lag screws (included). For installation on floating wooden rafts with lag screws (included). For vertical wall pools where anchorage to pool structure is desired rather than to deck.